"In sport, it's the ones that shout the loudest that get noticed and get what they need. For someone with mental health issues who suffers in silence, the help never seeks them out." While many high-profile athletes have chosen to speak out recently about their experiences of mental health problems, a new report has been hearing about experiences in grassroots sport. Football coach Melanie Timberlake was one of 1,200 people to respond to the nationwide study looking into mental health across sport. The 36-year-old, who has experienced post-natal depression, believes she would "fall to pieces" without sport. "Being part of the sporting community has had a hugely positive impact on my wellbeing and I hope that by being open about my own battles with mental illness I can help the players I coach, and everyone I work with, to better understand mental wellbeing." Her story is one of many shared in the UK-wide study by Edge Hill University and advice and support agency DOCIAsport, which collated responses from individuals across more than 50 sports and activities, from grassroots to professional level. More coaches responded to the study than any other role in sport, with 57% of grassroots coaches saying they had experienced mental health issues during their careers, compared to 46% of elite coaches. Of all the coaches surveyed, 44% said they currently experienced mental illness, but over half of those admitted they did not feel confident speaking to others in their organisation about their mental health. Timberlake was named Disability Coach of the Year by UK Coaching and currently coaches two pan-disability football teams. "It can be stressful at times and being a woman it's sometimes hard being heard in the male dominated sports, but it's the best thing I've ever done," she told BBC Sport. "In sport it's the ones that shout the loudest that get noticed and get what they need. For someone with mental health issues who suffers in silence the help never seeks them out. I hope this will change one day." Volunteers also reported high levels of lifetime mental illness (64%), with almost half (47%) saying they are currently experiencing mental illness. One male running coach told the study that he believed revealing his past mental health problems could affect his career. "I believed that my past would have a negative impact [on] the trust relationship you build with your athletes as a coach, if other people knew", he said. Experience of mental illness at some point in life was highest in respondents involved in hockey (79%), while 60% of people involved in cricket reported currently suffering from mental illness. 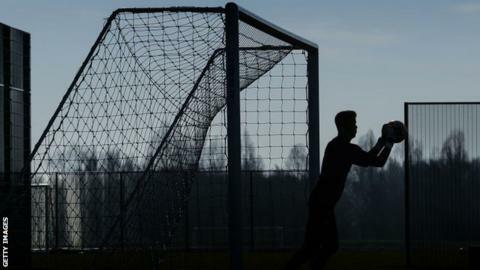 A former footballer who experienced a range of mental illnesses including anxiety, depression and substance-use disorder and is now a coach told the study: "I was released from a professional contract at 19 years old and struggled for many years with my identity. "I often identified myself as a failed footballer and couldn't see a future. Living like this led to issues with alcohol and gambling. "I graduated from university but didn't see this as a success. For many years I felt I didn't want to carry on with my life, but I carried on, surviving..."
Fifty one percent of the men who were surveyed reported conditions such as substance-use disorders, including alcohol, whereas women were more likely to report experiencing anorexia and bulimia. Ian Braid, managing director of DOCIAsport and the former chief executive of the British Athletes Commission, says his own experience of being signed off work with burn-out gives him hope of future change in this area. "People opened up to me about their own wellbeing challenges and talked about others they knew who were suffering, usually in silence," he said. "This survey shows that there is work to be done within the sector at all levels, and in all roles, if it is to maximise its contribution to the wellbeing of all workers and society more broadly." Edge Hill University's Professor Smith added: "We hope our findings will bring about important cultural change in the sector so that mental health becomes the responsibility of everyone and drives changes in policy and practice." For more information and support concerning mental health issues click here.